NREL scientist Chaiwat Engtrakul holds a Polyceed sample. Photo by Josh Bauer. There’s no summer vacation for the Wells Fargo Innovation Incubator (IN2). 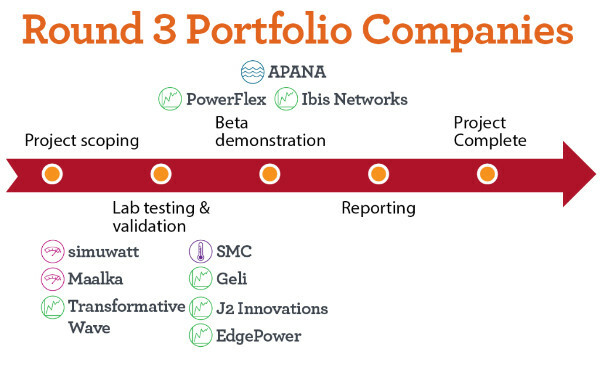 Instead, the program—which began in 2014 as a five-year, $10 million effort focused on commercial building startups—is revving up.Just ask Senior Energy Efficiency Research Engineer Shanti Pless, who is a PI for several IN2 projects and who works closely with the IN2 program management team housed in NREL’s Innovation and Entrepreneurship Center (IEC). 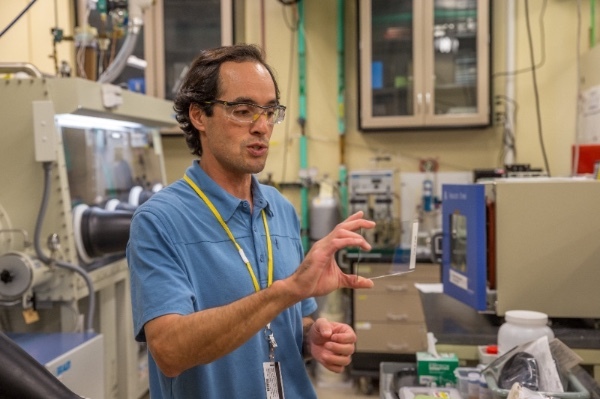 “NREL’s research living laboratories are being utilized heavily across all these partnerships to support these emerging technology companies,” he says. Since NREL and the Wells Fargo Foundation announced in January that IN2 is expanding to continue through 2022 with an additional $20 million in funding, the pace of research has quickened. Ten new companies have joined the program this year, while some of the companies from earlier rounds are completing their projects. 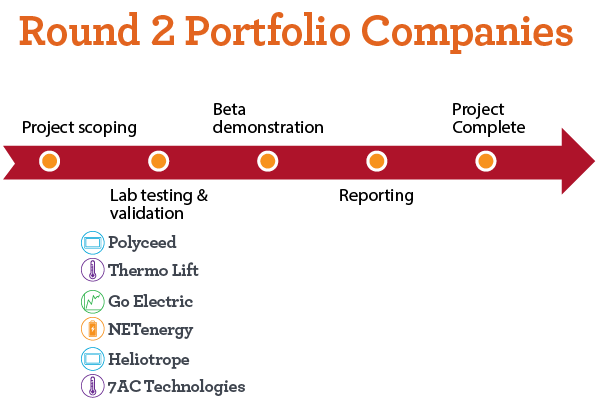 Including Round 3 selections, a total of 20 companies so far have been awarded in-kind technical and project support funding to date. “The goal here is to get these technologies into the actual Wells Fargo banks or other commercial building types. Drawing upon both the lab’s research-grade building facilities such as the Energy Systems Integration Facility (ESIF) or the Research Support Facility (RSF), researchers connected with IN2 can help companies move along a trajectory from benchtop to prototype scaling—and beyond. For example, Whisker Labs—a startup with a peel-and-stick, energy-metering system that was installed last year in Wells Fargo bank—was acquired by another firm in December. The company, which produced the first “beta-ready” technology to emerge from IN2 successfully completed testing in ESIF prior to a demonstration in a Wells Fargo bank branch in Colorado. The IN2 program team is keeping a sort of scorecard to keep track of the progress of IN2 projects. And while it may appear hectic at times, this is a good problem to have. “We are seeing great progress from startups in the IN2program,” said Program Manager Meghan Bader of IEC. LiquidCool Solutions prototype unit has undergone a series of tests in the ESIF data center next to the Peregrine supercomputer. The company’s concept is to submerge a server in a dielectric liquid that cools the electronic parts and, therefore, doesn’t require use of fans. “It’s proving out that a computer full of oil can operate next to a computer full of water,” Pless says. 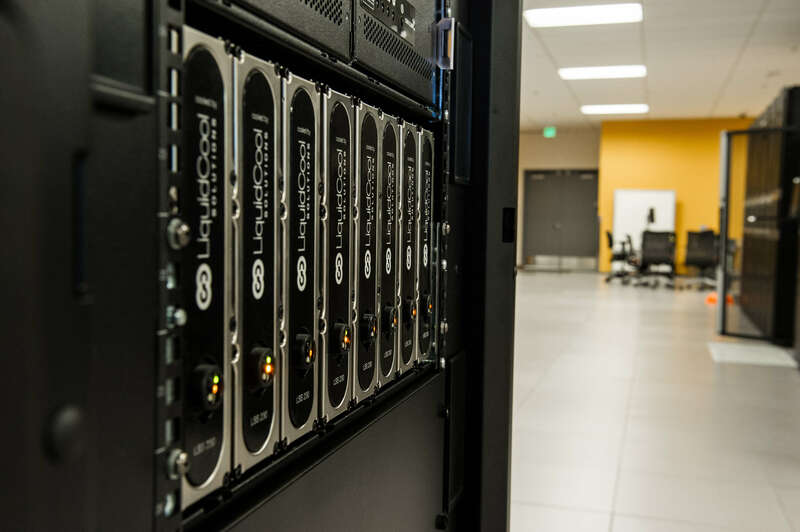 “Our facility folks and the high performance computing team has been great to work with as they recognize that there are new technologies coming down that their facility can be a research site for integration.” The LiquidCool Solutions technology is operational and is currently being utilized by the NREL OpenStudio team for computing needs. LiquidCool Solutions "Liquid Submerged Serve" at ESIF's HPC data center. Photo by Dennis Schroeder. Ibis Networks, a wireless meter and control company for plug loads, is making strides as the group recently installed their “Intellisockets” across several buildings on NREL’s campus. Ibis Networks’ Intellisockets are smart outlets that meter the energy use of equipment plugged into them, and NREL will be helping Ibis develop a learning behavior algorithm for controlling typical office plug loads. Typically, plug-in devices account for over 30% of whole building energy use in typical commercial buildings, which means algorithms like this could save a lot of energy. To collect data for their algorithm(s), Ibis Networks is targeting workstation equipment (computers, monitors, and other ancillary devices plugged into a cubicle), kitchen equipment (except for refrigerators), multi-function printers, and AV equipment in huddle and conference rooms. The demonstration just kicked off and will continue for the next 3-6 months. APANA, a cloud-based water management company, is discussing the possibility of a demonstration in NREL’s RSF. 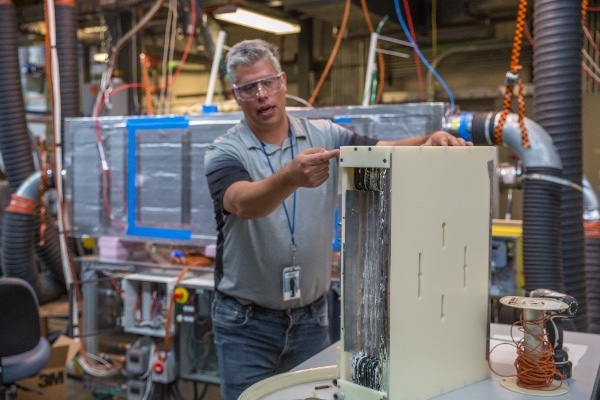 NREL mechanical engineer Eric Kozubal discusses a 7AC test unit. Photo by Josh Bauer. The program is continuing to grow in supporting clean technology companies in their path to market. The IN2 program sources potential program participants from more than 40 universities and regional accelerator programs that serve as channel partners. As the program grows and new startups come aboard, Bader said IN2 will expand into additional technology verticals including residential buildings, sustainable mobility and food/energy/water nexus, with the goal of working towards smart and connected communities of the future. The IN2 Program Management team looks forward to hosting all IN2Stakeholders for the IN2 Summit, August 16, 2017, on NREL’s main campus in Golden, CO. All Stakeholders should have received an email invitation, if not please email IN2@nrel.gov. For event details visit: in2ecosystem.com. In May IN2 hosted representatives from the General Services Administration and Xcel Energy on NREL’s campus, to learn more about IN2 technologies and how they can be implemented. Stay up-to-date with our quarterly newsletter. Stay up to date with our quarterly newsletter. © 2019 Wells Fargo Innovation Incubator.